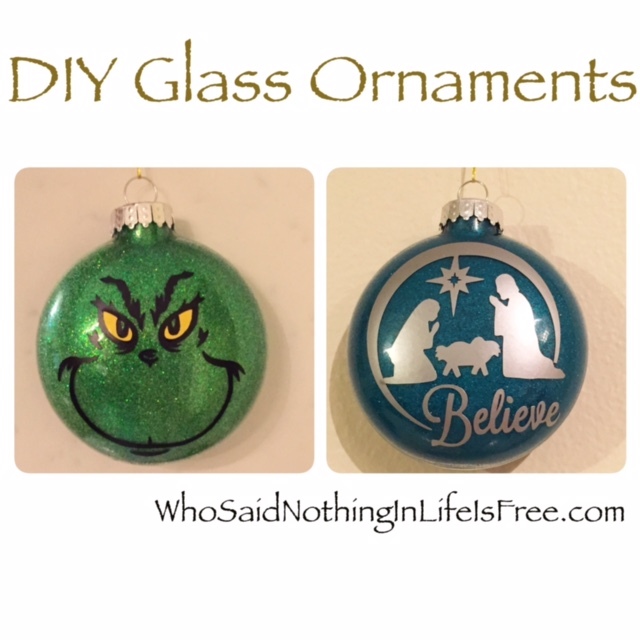 DIY Glass Glitter Ornaments Using a Silhouette Machine - Who Said Nothing in Life is Free? Pour fine glitter into ornament using a funnel. Make sure you coat all sides of the ornament and pour out excess. Now, go into the Silhouette online store and download design #52457. Center the design onto the ornament and press down (You may need to manually move some of the pieces that don’t lay down flat due to the ornament being round/oval. These are just so much fun to make and would make great gifts for teachers, family and friends !!! The possibilities are endless. I love the Grinch! can you make kaley a hello kitty one? I really am more interested in the cricut with each and everything that you are showing us! you rock! maybe I can save u for one after Christmas is over……….got to deal with the kids first. keep showing us all the fun things,i love to see them! I would love the ginch file. can you please send it to me? I was wondering if you would be able to send me the file for the Grinch, Turtles and the Jack, please? I have been trying to find them, but having a hard time. I not only pinned this to my pinterest ,but I made a whole new board for it…….just to keep the stuff you post,incase I ever get a cricut in the futre I will be ready for it! Where did you get the vinyl pattern for the grinch? I can’t find it on the silhouette site. Can you email me the Grinch also?!?! Could I please have the Grinch pattern as well? I am in love with making these ornaments. I would have never thought about it, thank you for being so creative! These are going to make fantastic xmas gifts. I hate to ask also, but could I get the Grinch also? Could u use plastic ornaments? The pattern to cut my own vinyl is what I meant. Thanks! Could I possibly have the Grinch pattern? My granddaughter and I love the Grinch. I have the village and a 4 foot tall Grinch that stands by the tree. I made her and her brother Grinch pj pants last year and she watches the Grinch movie all year long. And she’s only 4! If you can do that, I would really appreciate it. I’d love both the Grinch and the Nightmare Before Christmas files also please. Thanks so much! Love them! Can’t wait to try. Could I possibly get the grinch pattern too? Is it too late to get the Grinch pattern along with the Nightmare Before Christmas? These are by far the cutest ornaments I’ve seen. I would love the Grinch pattern too! I love your Grinch! Could I have the pattern too! Love your ideas! We are a grinch-loving family too. Could I get the cut file too? Thanks! Awesome tutorial! I would love the file for the grinch! These are fantastic! Would you mind sending the cut file for the Grinch and Nightmare Before Christmas to me as well? May I be sent the Grinch and the Jack Skellington pattern as well!? I love them! I would LOVE the Ninja Turtle pattern. I am trying to trace a coloring page and it just isn’t coming out like I want. LOVE yours! Thanks! I will happily share the Grinch and Jack Skellington but the TMNT I am not giving out. May I please get both the grinch and Jack Skeleton file? 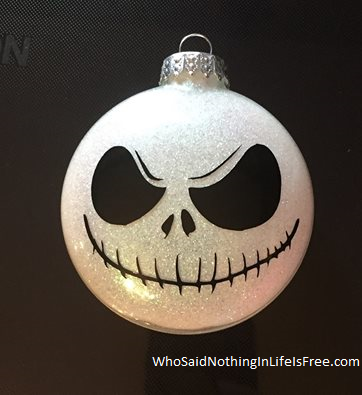 My daughter is doing her tree in Nightmare before Christmas theme and I would love to make a few of these for her. Got to make a few of the grinch as well. Thank You! I would love the files for these ornaments! So cute!!! Oh how cute! Could I get the Grinch and the Jack files please. I have a dear friend that would love to get them as a gift. These are beautiful! would love the Grinch,ninja turtles, and the nightmare before Christmas files too if that’s okay. Your work is wonderful! Oh my, love these! Could I also have the grinch and the Nightmare Before Christmas files? Thank You! love it! Could I please have Jack, grinch and Ninja turtles? Thanks. Love the grinch. Could you please send the grinch and nightmare before christmas files. Thank you. LOVE THESE!!! Grinch is sooooo cute! Where did you find the pattern? And what yellow did you use for his eyes? Great! Great! Great! I love, love, LOVE these files! Could I please have the grinch and jack? Absolutely love it! Could I please have Jack, The Grinch, and TMNT? Thanks so much and I will be following you too! I love the Grinch ornament, would you mind sending the file to me as well? You are so kind to share! These are wonderful. I’d also love the Grinch (and Jack Skellington) if you have the time. Thanks for sharing your creations! These ornaments are absolutely adorable! I’d like to have the Grinch and Jack pattern too. I know my nephews would love these! Thank you so much for sharing your creations! Would you mind sharing the grinch file? I’ve got my silhouette and vinyl ready to go! And thank you so much for sharing! Would also love to have the Grinch file too!! Thank you! Would. Love the TMNT and Grinch file. Willing to purchase. Can I Have the grinch as well? These are so cute. Thank you again for sharing! Great job! Will you send me the grinch file? Thank you! Is is too late for you to send me the grinch file? Can you please send me your grinch cut file? Thank! Can you please send me your Grinch cut file? Thanks for the cut files! What did you use for the yellow in Grinch’s eyes? I haven’t seen any yellow vinyl in the stores. Would you please send me the Grinch file? Yours is the best I have seen!! thank You! love your ornaments. Could you please share your Grinch file with me. It’s awesome! I love your ornaments. Would you mind sending me your adorable grinch pattern? It is totally adorable! Thanks and have a merry Christmas! May I get the Grinch pattern also? I just ordered the Silhouette Portrait and this is the first project I am doing! Happy Holidays! Are you selling the TMNT file? My son just asked me to make him ornaments and came across yours. Thanks! I love the Grinch could you please send me the pattern for silhouette too please! Thanks love these! I just found out my daughter’s 2nd grade class is doing a Grinch themed breakfast on 12/23. I would love to make these for the children. I know so many have asked…would you send me the file for the Grinch ornament? Thanks for the tutorial. I’m going to make the Ninja Turtle ones for my goddaughter (she loves them!). 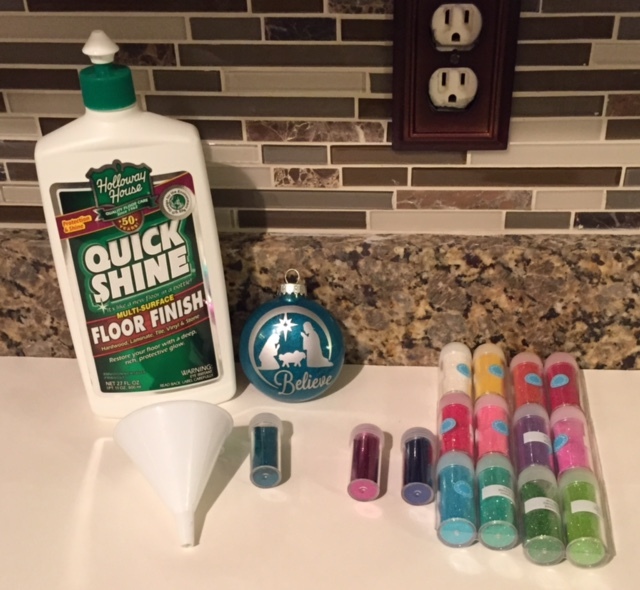 Do you think it would work to use Mod Podge instead of floor finsh? I have a bunch of Mod Podge so I was just wondering if that might work. Thanks! Would you share the grin h file with me? Thank you so much! Could you please send me the file to the 3 of these please? Thank you very much! I love your ornaments. Would you be able to send me the Grinch file? If it’s at all possible, would you be able to email me the Grinch, TMNT and Jack Skellington files? Thank you so much for all of your help, your ornaments are adorable! You have such great ornament ideas. Could you please send me the images for the Grinch, TMNT, and the Nightmare before Christmas as well. I am hoping to do these with my granddaughter!! Could you please email me your Grinch image? Thanks! Will you please email me the grinch file? I love it! Could I possibly get a copy of the Teenage Mutant Ninja Turtle file and the Grinch one as well??? Thank you! I hope I’m not to late!! If you could please email me your grinch, nightmare before Christmas, the believe one you have pictured above and I also see a comment about a ninja turtle file? If you could email those it would be great and appreciated soo much … life happens all the time near Christmas time and I’m soo far behind and need to send gifts back home 900 miles away to my nieces and nephews … Thank you soo much!! Could you throw me on that email list too? These are incredible! Thank you so much for sharing! Love the designs. Please send patterns for The Grinch and TMNT. Thank you very much!!! I love this !!! So adorable. I’m already making plans for next year. Could you please email me the Grinch, Nightmare before Christmas and Ninja turtles patterns as well. This is such a great idea. Thank you for helping me get a jump on next year ! I would love to have a copy of the above files. I would also be willing to pay for them. Thank you so much! I would love a copy of the Grinch and Jack files. My daughter is obsessed with them and her birthday is in 2 days! I would really love to make her 2 mugs with these designs and would be so grateful for the files. I am happy to pay for them as well. I am a newbie and still learning so it would be so helpful to me. Happy Holidays! I know my request comes after Christmas, but I too would love the Grinch and Jack files. Have you ever tried anything other than Quick Shine? I don’t own it do you know what else might work? I love both the ornaments! I would love a copy of the Grinch file. Have a Happy New Year. I LOVE the grinch! Would love if you would send that to me!! I also would love the Grinch and nightmare before Christmas files Thank you in Advance. I have a cricut I am thinking they will work on that also. Hi — I LOVE your designs. Can you please tell me where you got the designs? I need the Ninja Turtle one, the Grinch and Nightmare Before Christmas if you would not mind sending them to me please. Your Believe ornament is beautiful … very creative. Thanks so much for putting them on Pinterest! Hi. Just discovered your website and amazing projects. You have inspired me to step up my crafting. The ornaments are fantastic and I am searching for the glass ornaments. Are you still sharing the Grinch and TMNT designs? If so, I would greatly appreciate it. could you please send me any Jack Skellington or Nightmare before Christmas things? I would really like the Grinch cut file – I just got a Cameo and would like to try it out. I love this. Did my first ones night before last. Would you care to send me the svg files for Ninja Turtle and Nightmare before Christmas …thank you so very much. And the nativity one please. That is a paid one from the ailhouette store so it can not be shared. I think I linked to it in my post. Would you please send me the Grinch file? Thank you. Oh my these are sooo cute Absolutely love them and would love to try on my moms new cricut. By chance would you be able to send the cut file for the Grinch and Jack please? Thanks so much! Hello could I also get the files for Jack skeleton if you have Ninja Turtles and the Grinch sent to me they are so cute I can’t wait to make them this year thank you. Can you please send me available files. Especially the grinch? Is it still possible to get the grinch file? I love it! Hi there! I would love to have the grinch and nativity files if you still have them available. My kids love them! I love these! Could you please send the Grinch and The Nightmare Before Christmas patterns. Hi – any chance I can get the Grinch and Jack emailed to me? Do you think I could get them to work on the explore? BTW, these are awesome!! I LOVE THESE!!! Can you please send me the grinch and Jack pattern! Thanks so much for sharing this awesome idea!! May I get the Grinch pattern too! I would love to make these for my 4 boys who love that movie! Thanks! I would love the Grinch and Jack file, thank you! Your ornaments are absolutely PRECIOUS. Would you please share the grinch face? Also, if you have a star wars, I would love to have it too or if you can tell me where I can find it. Thank you so much and awesome job!!! May I please get the Grinch pattern? Thank you! Would you be able to send me the Grinch file…. Awesome job, I love, love, love it!!! First of all… Awesome job in the grinch ornanment, it turned out fantastic!! Would you be able to send me the grinch file? Hi I just asked for the emoji file…not knowing you had a grinch file too. Could you possible send me the grinch one too. You are so inspiring!!! I did names last year so this would be so awesome to do this year!! Thanks so much! Hello, I also would like these files, if you are able to send them. Jack, grin check, and I love the emoticons for my daughter. Hi. Love the emoji ornaments! Unfortunately I don’t have a silhouette machine or a cricket cutter. Do you sell the precut vinyl faces to stick on to the ornaments? Hi there! These are beautiful! Could I please have the Jack file & Grinch if you’re still sharing? Thank you & have a blessed week!